This week I’ve been working on a series of reviews of inexpensive goose down blankets. You can see the other comforter brands right here in my list of the best comforters. Today, we’re going to look at a down comforter that is easy on the budget at just under $200. The brand of this down feather comforter is “Royal Hotel” and it is a year round warmth comforter. This “Royal Hotel” comforter is filled with 750 fill power “Siberian” goose down and made with an incredible 1200 thread count Egyptian cotton fabric. 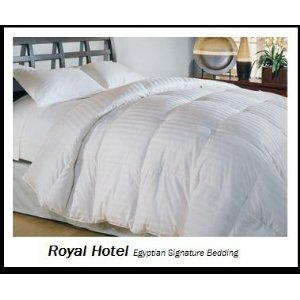 From my research, Royal Hotel is a manufacturer of luxury bedding that specializes in Egyptian cotton. They offer a range of products including duvet covers, sheets, feather pillows, and goose down filled comforters. First off, the two facts that stand out for me about this comforter is the fact that it uses high thread count Egyptian cotton and high fill power goose down. In my experience, even down comforters that cost more than $400 use cotton fabrics of at most 500-600 thread count and the fill power usually only goes up to 700. Royal Hotel stands ahead of the pack with 1200 thread count Egyptian cotton covers and 750+ fill power goose down. While this is the official specification, the real test of the fabric’s quality is how it feels to the touch. The fabric cover is indeed high quality and felt extremely smooth against my hands. It is extremely tightly woven and did not snag against dry skin or nails. This is extremely important as there is nothing worse than having to feel like you need to have a manicure or pedicure just to lay down on your sheets! As for the goose down, it puffed up beautifully after I let the comforter air out and “settle” for several days. It is extremely light since the king size contains 50 oz. of goose down and the blanket never felt heavy. To see how well this comforter would work in cold weather, I turned down the thermostat to 60 degrees for several nights. Sleeping with just a sheet and the comforter was extremely comfortable and the temperature was just right. The white goose down kept me comfortably warm throughout the night and my feet were never cold. The material is extremely breathable and I had no problems with sweating or being too hot during the night. A baffle box stitching keeps the feathers from shifting around so you won’t end up with bare spots or lumps after several months of use. A side gusset, basically a piece of fabric “wall” between the two sides of the blanket, lets the down feathers expand to their max volume. This means your comforter will be better insulated as well as plush. For a $300+ comforter that costs less than $200, the Royal Hotel white down comforter exceeded all my expectations. Don’t let the light weight of this white goose down comforter fool you, it keeps you extremely warm even in cold weather. This comforter is a great choice if you hate being weighed down and suffocated with the feeling of a heavy blanket. If the more expensive luxury down comforters are out of your budget, then you definitely need to give this one a try. Also remember to purchase a duvet cover to keep your new comforter clean and fresh! So is the “Royal Hotel White Siberian Goose Down Comforter” too good to be true? While you get an incredible value for your money, I do have some niggling problems to nitpick about this comforter. Royal Hotel is a bit heavy handed with the marketing. “Siberian” goose down is just a marketing ploy. Most high quality down comes from Eastern and Northern Europe. Siberia is not a source of down, it just sounds cold and exotic! First off, while the fabric is extremely smooth and soft, it does not feel like true 1200TC Egyptian cotton. At most I would put this at 800TC. However, this is still better quality than what you will find with most down comforters at this price range. Secondly, it took longer than expected for the comforter to expand after taking it out of the factory packaging. Usually new down comforters come out flat as a pancake when you unpack them and it takes a day or so for the blanket to fully expand. However in this case it took more than 2 days before the feathers fluffed up. In the end I was pleased with the volume of the down feathers so there weren’t any problems with this comforter. Most people are as happy with their Royal Hotel goose down comforters as I am. The only frequent complaint is that the comforter does come out flat and deflated. Like I stated above, you will need to be patient and wait a couple days before the comforter puffs up. Take the comforter out of its bag and fluff it up once a day for a couple days. The best way to do this is just to spread the comforter out and sleep in it for a couple nights. Before you know, it will feel as soft and plush as you would expect from a 750 fill power down comforter. Royal Hotel’s Siberian White Goose Down Comforter with 750+ fill power and 1200 thread count is currently available on Amazon.com.